12 or more - $22.99 ( $311.88 $275.88) . Suitable for use from birth on wards or if changing from breastfeeding. Ideal for feeding in a bottle, but also for preparing Holle Wholegrain Porridges. Easy to digest, gluten-free, no added sugar, with Demeter milk. HOLLE Bio PRE formula will provide you with a complete mother’s milk substitute. This holle formula contains all the necessary nutrients the baby needs during the first six months of life. The HOLLE Bio PRE-starting milk can be fed from birth as a sole nutrition until the introduction of further food. HOLLE Bio PRE formula is also suitable for feeding and can be given during the mixed diet until the end of the first year of life. HOLLE Bio PRE is easily digestible, tasty, digestible, gluten-free, wheat-free and soy-free. Conventional starting particles have vegetable oils as the source of fat. In the HOLLE Bio PRE-starting milk this vegetable fat content is reduced and replaced by high-quality Demeter milk fat. The combination of plant and milk fat provides an optimal fat composition in the initial milk. In addition, there is a difference to conventional carbohydrate combinations. 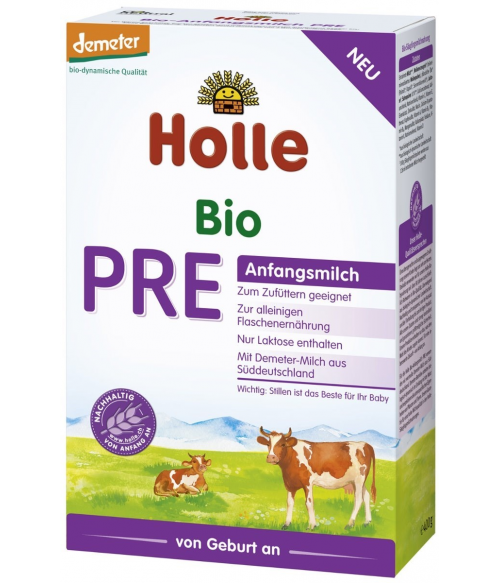 The HOLLE Bio PRE starting milk is based on lactose (milk sugar) as the only carbohydrate. Switched from Hipp to Holle and feels like baby feels better with this one. The delivery is fast. Definitely will stick to this. The ingredients way better than similac or infamil. My baby boy is primarily breastfed but doesn't switch between breastmilk and formula easily. He would always projectile vomit after drinking another Organic brand. He guzzled this one down with no problems! Shipping was super fast, would've taken only 1 day if USPS worked on Sunday. There was also a diaper sample pack included, which I greatly appreciated. Looking forward to purchasing again from your website!